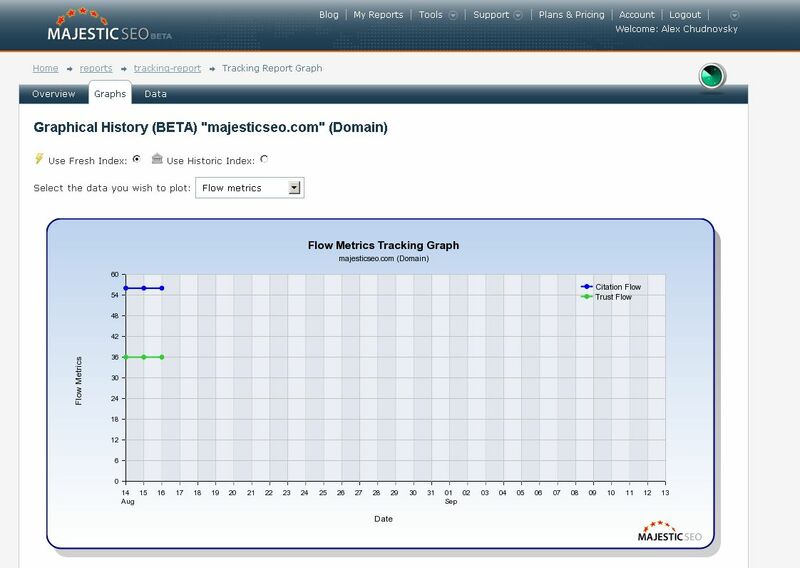 This week sees a new link tracking report from Majestic SEO letting you view the Trust Flow, Citation Flow and other link quality characteristics of any URL or website over time – updated daily. The report means that you will be able to follow the link quality of a URL and it will be interesting to see if there is any correlation between a change in a URLs position and whether the change was caused by an increase in good (or bad) links. Because Flow Metrics start calculating many link iterations away from the url you are tracking, there does not have to be a change to the pages that physically link to you for there to be a change in the page’s fortunes on the web. Unlike the Backlink History checker, which tracks every website’s link count all the time anyway, this report will only start tracking a URL, website or domain (your choice) when you start asking us to do so. This is great because we can include more variables in the tracking. Trust Flow and Citation Flow side by side will be the default layout. Then – just for convenience for data junkies who want to see day by day whether there is a change in the world’s link graph that affects them, we default the whole report to a dashboard which compares today’s metrics with yesterdays with a nice bit of green or red to let you see at a glance whether today’s the day you like or hate penguins and pandas. The opening dashboard view of the report, updated daily. Can I get the data historically? Because Flow Metrics are so new and advanced the data does not go back for five years. In addition, people only care about a fraction of URLs on the web, so it only makes sense to start tracking over time when you know you want it. We then store that data especially for you – which means it is attached to your account status. Keep your account live to maintain the data or remember to export it as a CSV file occasionally as a backup. Some of our oldest and most loyal of users might remember that we once tried to check every new link found or deleted to your site, day by day. It was a computationally complex method which we abandoned in 2010 in preparation for our Fresh Index development plan. I think you’ll agree that Fresh Index rocks :). However – it is great to be able to bring back some tailored reporting to users and we know how powerful it is to be able to track data over time. What’s other differences between these charts and the Backlink History charts? Glad you asked. Apart from tracking Flow Metrics over time, the data is also more accurate when it comes to backlinks and referring domain counts, because of the way in which the original data is stored and managed going back over 5 years. Now we are recording like with like from day to day. So this is going to cost a lot right? Nope. This service will be open to all accounts of silver and up. Whilst you use a tiny token of your account’s resources to set up each report to stop scraper abuse, that’s about it. We want you to come back and check your data regularly. We don’t want you to have to refresh your advanced reports every time if the changes look small… but likewise we want you to know when the link graph has changed around you. So we would love to hear your comments and thoughts. Is this useful? Will you use it on every customer and competitor from here on in? Or only when needed? Where do I see this new function? It is a new type of REPORT, so wherever you see this symbol: you can create reports. There are now three types: Standard, Advanced and now Tracking reports. Once created, they are grouped together in your reports folder. Well done guys this looks like it will be a fantastic tool. Like you say, I’ll be keen to see any correlation between an uplift/decline in visibility and an increase/decrease in good/bad links. Will there be any “free trial” options for those without Silver+ accounts? Best way to do that is to find us at a conference… the next one is BrightonSEO and the tickets are free. That said… they are “sold” out. Would you like us to send you one as we are sponsoring the event? Excellent addition. Well done guys! This is really interesting addition. Excellent addition to an already great tool set. Will be interesting to see how this data correlates to visibility and link activity. Are you guys planning to attend any conferences in Australia? Which conference would you recommend as the strongest over there, Mike? It’s really great to see the toolset expanding well. Here I was worrying about viable alternatives when YLE went down last year. Awesome! But I like the Keyword Checker feature even more. (I could not post there – it seems that comments are blocked on that page – Unfortunate because I just received the link from the monthly newsletter). Its the number one for SEO Backlink metter! MJ SEO rock! Its the number one for SEO Backlink metter! MJ SEO rock!yes,,great tool.. It sounds like a tool that will make it easier to provide urls for the GWT disavow tool.